If you haven't heard yet, this is Kindness Week in Ottawa. 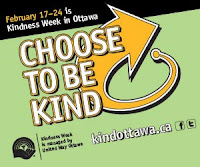 Kind Ottawa has become a vibrant movement in our community, encouraging people to “choose to be kind”. Kindness Week 2012 takes place from February 17–24. I've written about Kindness Week before as a great opportunity to "use your skillz for good" — use your personal or professional skills to help a friend, a colleague or a stranger. For info, check out the site, or follow #KindOttawa and @kindottawa on Twitter. And don't forget to spread the message!